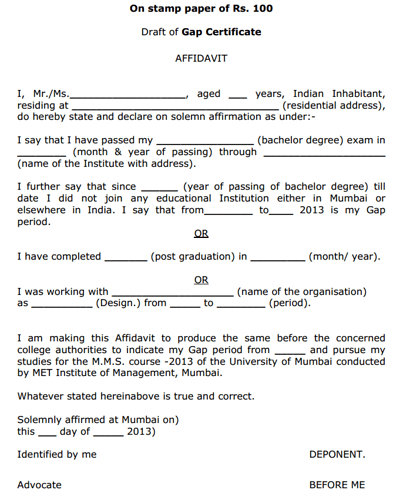 Where to get Gap Certificate or Gap Affidavit? 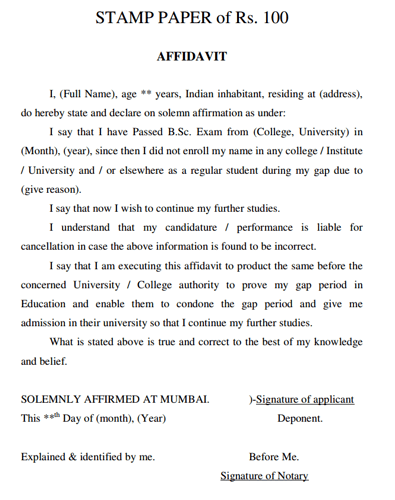 Gap certificate or Gap Affidavit is your declaration on the non-judicial stamp paper stating the reason for taking gap and declaration that you did not take admission to any other college, university or courses during the gap year. You can buy stamp certificates from any notary, sub-registrar offices, courts. Stamp paper of Rs. 100 is ideal for such purposes but most of the times they are not available so you can use Rs. 500 stamp paper as well. You can contact advocates or notary desks nearby, they will take nominal charges for preparation of the gap certificates and sign in front of them. An answer to your query is Yes, You need to issue gap certificate to continue your PG education.Thanks for visiting us. Hi, I don’t really understand your query but from what all I understand NOC certificate you talking about is not really required for GAP Certificate.